The year is 1811, the place, Louisiana’s River Road. Five hundred enslaved men and women – armed with hoes, tree limbs, machetes, a few pistols – march in the mud and cold rain towards New Orleans to create a new country, a free country. Under the leadership of a fellow slave, Charles Deslondes, they hope to escape the brutality of the sugar cane plantations and live as free people. Never heard of this revolt? Most people haven’t. It was the largest slave revolt in North America, but the slave owners of 1811 wanted the attempt to be lost to history. Two hundred years later, Beth Sanders, a Black woman who grew up on the River Road, returns to Louisiana to tell the story. With her investment banking wealth, she buys a plantation and restores it to give tours from the slave point of view, but meets with resistance from her family and the larger community. Scenes alternate between 1811 and 2011. Because the past exists in the present, four of the characters are played by the same actors in the 1811 and 2011 scenes. 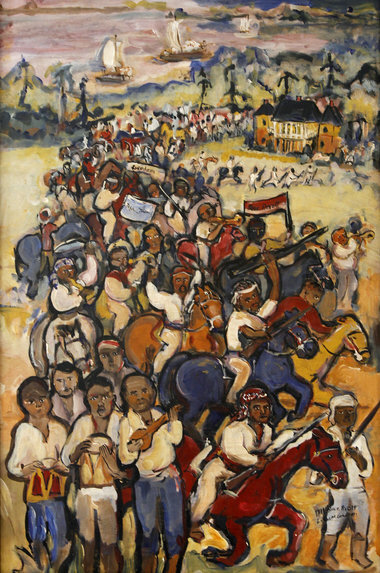 In Act One, the 1811 scenes tell the story of the planning and execution of the slave revolt, and in Act Two we experience the consequences of the failed revolt. In the 2011 scenes, Beth is faced with denial and danger as she struggles to bring the revolt and slavery’s realities to light in a place wedded to a romantic view of the past. If you'd like to read ALONG THE RIVER ROAD, please download the PDF here. If you wish to perform the play, please contact me for permission and royalty information.